Whenever Yu Ji wants to use a non-delay tool or basic card, he can play any card face down and speak the card that he wishes to use. Then, anyone can choose to not believe him. If everybody believes Yu Ji, the card is flipped and goes into effect as stated. If there are any players in doubt, the card is flipped. If Yu Ji is telling the truth, all characters that doubted lose one health. If Yu Ji was not telling the truth, the doubting characters draw a card. If anyone doubted and Yu Ji told the truth and the card is a heart, the card goes into effect. Otherwise the card is discarded. Yu Ji cannot use "Bewilder" for equipment cards and time-delay tool cards like Capture. If there are doubters when Yu Ji uses "Bewilder" to Attack somebody, he can try again. The original Attack was rendered useless and Yu Ji was not considered to have used an Attack. When other characters lose health from not believing Yu Ji using "Bewilder," their abilities cannot be used. For example, when Sima Yi takes damaged from not believing, he does not get to take a card from Yu Ji. This is because they are losing health and not taking damage. If Yu Ji kills a player from their disbelief, it does not count as his kill. He cannot draw three from doing away with a rebel in this fashion. If a player is on the brink of death, they do not have the option of not believing Yu Ji. They are forced to believe anything he says. This includes a Zhou Tai that has zero health. 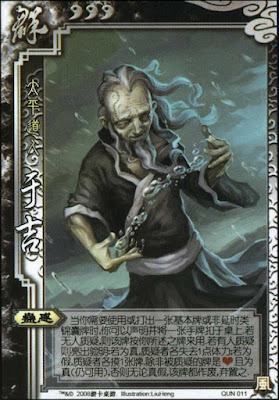 Yu Ji has the unique option of using any card as any other card, offering him nearly unlimited flexibility with options. Yu Ji is a lot of fun to use. It is fun to make people guess whether or not you are telling the truth and see their frustrations when they make incorrect guesses. Draw 2 and Peach cards are mostly heart cards, so when Yu Ji uses "Bewilder" to use these cards, other characters can be reluctant to disbelieve. Yu Ji is usually very unpopular with the opposing team because he is very annoying. He only has three units of health, so he is a weak target. Even if Yu Ji uses "Bewilder," tells the truth, and others incorrectly guess that he is lying, Yu Ji's card will be rendered useless it is a heart. Even though the enemies will be damaged, Yu Ji is also negatively impacted. Yu Ji cannot use "Bewilder" when he has no hand cards. Card destruction is extremely potent against Yu Ji. Zhang Liao/Gan Ning/Zhang He - These characters specialize in card destruction, a tactic that is very potent against Yu Ji. King Yu Ji is not a good king choice. He is extremely fragile and the rebels will simply take turns in not believing him during "Bewilder." Yu Ji is not a very good loyalist. There are not a lot of options for him to benefit the king. Rebel Yu Ji is a mediocre rebel. He can focus his attention on the king and cause damage to the king and his loyalists when they disbelieve him when he uses "Bewilder." Spy Yu Ji is not a good spy choice. He is not capable of lasting a long time. Yu Ji is definitely not one of the strongest players in the game. There are some significant problems that he comes across. However, some people find him to be a lot of fun to use and are willing to accept the fact that they will probably lose when using him. If you are one of these people, go ahead and use him. After all, don't we all play this game to have fun?